The 60th (Royal American) Foot was raised, by Act of Parliament, in 1755 as a special regiment designed to fight in North America. The officers included many foreigners, among them was the Swiss Henri Bouquet who later introduced methods to help them fight in the forests and led the regiment to victory at Bushey Run. The 60th did not start off as a rifle regiment and the uniforms were red like the other British infantry units. There were grenadier companies but only one light company. They fought the French at Ticonderoga, Fort Duquesne and Louisbourg and were with Wolfe when he won Quebec. It was General Wolfe who gave the 60th their motto Celer et Audax (swift and bold). The 60th served for many years in the West Indies, adding Martinique to their battle honours in 1762 and 1809. They also fought in the American War of Independence and distinguished themselves in the Southern States. It wasn't until 1797 that green uniforms were introduced. A 5th battalion was raised, by another Act of Parliament, in Cowes on the Isle of Wight to serve in America only. The strength of the regiment came mainly from Hompesch's Mounted Riflemen and Lowenstein's Chasseurs. They were armed with rifles instead of muskets and wore coats of green with red facings. By 1881 when the Cardwell reforms had officially removed the regimental numbers from all the regular infantry regiments, the King's Royal Rifle Corps was a well established British regiment having distanced itself from it's 'foreign' beginnings. The 3rd battalion had been raised in 1855, in Dublin. After 14 years service in India and a spell at home they were sent to South Africa in 1879 to take part in the Zulu War. They stayed on for the First Boer War of 1881 and fought at the two disastrous battles of Ingogo and Majuba Hill. Under the command of General Sir George Colley, 5 companies of the 60th Rifles along with four guns and 38 mounted men left camp to deal with a force of Boers who were blocking Colley's lines of communication. The Boers were in greater numbers than anticipated and pinned Colley's men down. Casualties were numerous and it began to rain heavily. The fire-fight lasted all day and there was no way out of the situation until nightfall. Colley ordered the withdrawal which proved to be a very difficult task. Many wounded men had to be carried and the river Ingogo had to be crossed. Before the rain fell it was a small stream but now it was a deep torrent. The slippery roads proved too much for the exhausted men and horses, and many of them fell by the roadside. The defeat of the British Army at Majuba Hill was a humiliation for Britain and a huge morale boost for the Boers. The memory of this battle provided a spur to motivate the army when it came back to South Africa in 1899. As far as the doomed General Colley was concerned it provided clear proof that he was incompetent. As a result of the General's mishandling of the situation, the 60th Rifles managed to avoid much of the danger. Two companies of the regiment under the command of Captains C H Smith and R Henley were detached from the force and left on Imquela Hill while the rest climbed Majuba Hill, on the night of the 26th Feb. A company of 92nd Highlanders was ordered to entrench themselves on a ridge at the foot of the hill and wait for another company of the 60th to join them from the camp. The 60th duly arrived at 5am, commanded by Captain E Thurlow and two second lieutenants, Pigott and Howard. Looking up at the summit of Majuba 1,400 yards away, they saw that the main part of the army had arrived there, but were soon under attack. The firing from the Boers was sustained and very effective. Even thought the British had the advantage of the high ground they were driven from their position and men ran down the hill to avoid the deadly Boer rifle fire. Colley had been shot dead and the army was in disarray. The 92nd Highlanders and 60th Rifles prepared themselves for their share of the fighting, under the command of Captain Robertson of the 92nd. The first attack came from 600 or 700 mounted Boers who surrounded the two companies and exchanged fire. The wounded from the summit were brought in and treated by Surgeon-Major Cornish as well as he could. Before too long Robertson and Thurlow decided to retreat. The men had to scramble down a steep slope, into a ravine with mules loaded with stores and ammunition. The fleeing men were fired on by Boers who took up positions among the rocks above them. Miraculously the casualties were only 4 killed, 11 wounded and 22 prisoners. Luckily the artillery were able to disperse the enemy to a certain extent, and cover the retreat. Meanwhile the two companies of the 60th that had remained on Imquela Hill had received no orders and were able to observe the disastrous events unscathed. The 3rd Battalion KRRC were at first part of a diversionary force sent to Alexandria in July 1882 to fool Arabi Pasha, the leader of the Egyptian uprising, into thinking that they were the main British force. Major General Sir Archibald Alison was in command of this garrison of 3,755 men which consisted of the 1st bn South Staffordshires, 3rd KRRC, Royal Marine Light Infantry and Royal Navy sailors. A reconnaissance in force was sent south to find out the strength and position of Arabi's army. They discovered that the enemy were 9,000 strong and increasing daily. During this reconnaissance there was a skirmish at Kafr Dowar in which Lieutenant Howard Vyse of the KRRC was badly wounded. Private Fred Corbett, also KRRC, stayed with him until help arrived to carry the lieutenant away. While there, Corbett was under constant fire from the enemy, but he tried to stem the bleeding, and when help arrived he assisted in carrying the wounded officer off the field. 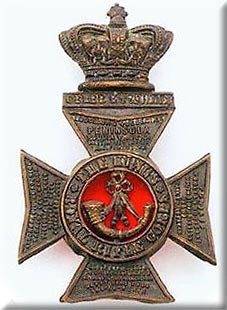 Corbett received the VC for his bravery. Sir Garnet Wolseley landed at Alexandria on 15th August with the main part of the British and Indian army. Actions were fought at Tel-el-Mahuta and Kasassin which did not involve the KRRC to any great degree. By September Wolseley's army was re-organised for the assault on Arabi's well defended position at Tel-el-Kebir about 40 miles north-east of Cairo. The 3rd battalion KRRC was in the 4th Infantry Brigade along with the Duke of Cornwall's Light Infantry. The brigade, commanded by Colonel C Ashburnham, was in support of Brigadier Alison's Highland Brigade positioned on the left of the line. Nearly all illustrations and paintings of the battle of Tel-el-Kebir show the Highlanders scaling the steep earthworks, but the King's Royal Rifle Corps backed up the Black Watch very effectively in their struggle against stiff opposition. The battle, fought at daybreak after the men had spent the night moving silently into position, was a complete success. Casualties were relatively light; out of a force of more than 17,000, the number killed amounted to 48 other ranks and 9 officers, wounded: 355 other ranks and 27 officers. The battle of Tamai occurred during the Suakin Campaign of 1884 led by General Sir Gerald Graham. The 3rd battalion KRRC were represented in Graham's force by a detachment of 30 men in the Mounted Infantry company. They were commanded by Lieutenant Percy Marling who won a VC at this battle. The British advanced in two squares to engage the dervishes who were hidden in a ravine. Marling's KRRC division were sent forward to reconnoitre and were joined by Lt Thornon's Royal Sussex MI division. They found themselves in difficulties with a large group of the enemy closing in on them. 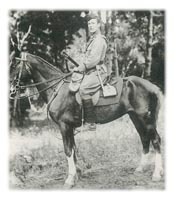 Private Morley of the Royal Sussex was shot in the stomach and had to be helped back by placing him on Marling's horse. Rifleman Hunter of the KRRC assisted in this. Meanwhile one of the squares was broken into by the dervishes but it was still safe enough to take the wounded Morley. The mounted Infantry fired on the enemy who had gained entry to the square and they were forced to retire. With the aid of Naval machine guns the enemy were driven back and retreated towards the hills beyond Tamai. They were pursued by the cavalry. Unfortunately, Morley died of his wounds the next day. The belated Gordon Relief Column commanded over all by Sir Garnet Wolesley travelled mostly by river to Khartoum. But a force of camel mounted troops under Sir Herbert Stewart was sent overland to relieve General Gordon who had originally been sent to organise the evacuation of Egyptian troops from the Sudan where the Mahdi had taken over. There were 4 companies of Mounted Infantry troops using camels, which were thought more suitable for a desert crossing. The 3rd battalion KRRC provided three officers and 90 men for this force; one platoon in A company with the South Staffs, Gordon Highlanders and Black Watch, and two platoons in C company along with 2 platoons from the Rifle Brigade. The battle was fought at the wells of Abu Klea, between 1,100 British troops and 3,000 Mahdists. The men were dismounted and a square was formed with the camels inside. A section of sailors commanded by Charles Beresford with a Gardner machine gun were outside the square firing on the enemy. But the gun jammed and the sailors , except for Beresford and one other, were killed. The enemy gained entry into the square but were beaten back leaving 800 of them dead compared with 74 British dead. On 25th November 1890 the 1st Battalion left Aldershot and embarked at Portsmouth for India on the HMS Crocodile. On 27th March 1891, when the Bunerwal tribe showed signs of trouble, the battalion marched from Rawalpindi to Durband as part of the Reserve Brigade in the Hazara Field Force. They reached Durband on 30th March but the Bunerwals problem had receded so the battalion remained there inactive. On 7th April, when it was heard that there was trouble on the Miranzai border, they left Durband and marched to Kohat. They travelled by train from Hasan Abdal to Kushalgarh. They had to cross a 300 yard pontoon bridge across the Indus, then to Gumbat and finally Kohat on 12th April. There they established a field depot and continued on to Hangu which was the base for the Miranzai Expedition. The 7,400 strong force, led by Brigadier-General Sir William Lockhart, was split into three columns. The 1st KRRC was in no.1 Column led by Colonel Sim and included the 5th Gurkhas, two Indian regiments and a battery of RA Mountain Artillery. They left Hangu at 5am and marched towards a fortified village called Tsalai which was situated high in the hills. At the foot of the hills they waited while the Gurkhas and Punjab infantry skirmished. They then advanced up the hill and 3 miles beyond to Tsalai from where they were fired on. The artillery gave them covering fire as they approached but the CO Lieut-Col C P Cramer was badly wounded in the wrist and Major Egerton was also wounded. Rifleman Forrest was badly wounded in the chest. When they burst into the fort with fixed bayonets they found that the enemy had fled. The next fort was Sangar where two companies of the KRRC remained while the rest of the column continued, fighting small actions and storming 5 more forts. In these battles, Rifleman Frank Stokes of E Company was killed. According to the diary of Rifleman Arthur Pickett, the most exciting action occurred on 20th April. After marching and waiting for 9 hours they sighted the enemy at 1pm and fought with them until 5pm. They put the tribesmen to flight down the hill, killing 300 and capturing their weapons. They worked closely with the Gurkhas but Pickett was sickened by the way they cut up the bodies with their kukris and burned the pieces. The forts and villages were destroyed and crops spoiled. The battalion was re-united at Sangar on 3rd May and moved to Fort Gulistan on the Samana Range. They then marched up to the Khanki Valley as far as Mamuzai Bazar. They moved from village to village ensuring the submission of the occupants. Any fortifications were blown up. The 1st KRRC were awarded two clasps to their Indian General Service Medal: HAZARA 1891 and SAMANA 1891. In April 1892 the battalion was split up. HQ and 4 companies were stationed at Ghora Dhaka in the Murree Hills while the remainder moved into Church Lines in Rawalpindi. They were reunited in September to join the Isazai Field Force commanded by Brig-General AG Hammond. Hashim Ali of the Isazai clan had returned and was inciting rebellion. In October the brigade crossed the Indus, marched to Balo and burnt some villages. Again crops were destroyed over a considerable area, but there was little fighting so they returned to Durband. On 10th Oct they marched out of Durband intending to return to Rawalpindi but cholera broke out among the men and the battalion was quarantined in Margala. The cholera came under control but then half the battalion were struck down by malaria. Those that were fit enough returned to Rawalpindi where, on 28th Oct they were joined by 317 men of the 4th battalion from Burmah. The trouble in Chitral, on the North-West Frontier, began in 1892 when it's ruler, the Mehtar died. Various leaders vied for the throne and two of them proved troublesome to the British, Umra Khan and Sher Afzal. The fort of Chitral was in the control of British officers and 420 Indian troops. The siege started on the 3rd March 1895 after an abortive sortie in which the British commander was killed. Command fell on Captain CVF Townshend who achieved fame with the defense of Chitral but who fell from grace in World War 1 at Kut. On 16th March the KRRC were told to prepare for active service and every man was examined to determine his fitness. They proceeded to Hoti Mardan where they were to join the relief force. This force was split into two columns, one, the Gilgit column, approached from the north-east, and the other from Peshawar in the south-east. This latter column had to go through the Malakand Pass. It was commanded by Major-General Sir Robert Low and included British battalions as well as Indian. The 1st Battalion KRRC were one of the British battalions who were required to scale the heights at the Malakand Pass to reach the Swati tribesmen who were firing down on them. The tribesmen were extended along the crest of the pass and they had fortified the spurs of the hills with a series of stone walls which had to be stormed one at a time. While the Guides and Sikhs made a flanking movement, the Gordon Highlanders and King's Own Scottish Borderers were required to make a frontal attack on the walls. Artillery fire was concentrated on the enemy while this was in progress. The KRRC were in support, and whilst moving into position, had discovered an old Buddhist road that later proved to be of great use in the movement of pack trains. They caught up with the Scottish battalions as they charged the final enemy position. The tribemen fled down the hill pursued by the Bedfordshires and 37th Dogras. The battle had lasted 5 hours, resulting in the death of 500 tribesmen out of an estimated 12,000. The British lost 10 killed and 51 wounded. The KRRC suffered four men killed, Riflemen Carter, Gardiner, Gillard and Walker. The Gordon Highlanders lost 3 men, the King's Own Scottish Borderers lost 2, and the Bedfordshire Regiment lost 1. Low's men reached Chitral on 16th May and found that the Gilgit column had arrived on the 20th April to end the siege. The 1st Battalion The King's Royal Rifle Corps sailed from Bombay on 10th Dec 1896 bound for Mauritius via Capetown on the troopship RIMS Warren Hastings. It stopped at the Seychelles for coaling and arrived in Capetown on 28th Dec where half the battalion disembarked for service in South Africa; B D E and F Companies, for garrison duty in Wynburg. The remaining 4 companies, A C G and H and HQ were to sail on to Mauritius. The CO of the battalion, Lieut-Col MCB Forestier-Walker went with this half battalion along with 9 other officers, 2 WOs and 514 men. The Warren Hastings left Capetown on 6th Jan 1897. As well as the 526 men of the KRRC the other troops on board were a half battalion of the 2nd York and Lancasters (410 men), a detachment of 2nd Middlesex Regiment (25 men) and two other officers. There were also 7 officers' wives, 13 other ranks' wives, and 10 children. The crew numbered 253 making a total of 1,244 people. Mauritius is an island in the Indian Ocean, about 400 miles east of Madagascar. For the first week of the trip the weather was fine but on the 13th the wind shifted south and it rained. That night it was pitch black and the rain fell heavily. The ship was 8 miles off course when, at 2.20am on the 14th it hit a rock off the coast of Reunion. All aboard were awakened by the sound of heavy bumping and grating. The water flooded in and the ship was in danger of sinking. The ships captain, Commander Holland ordered that the men should fall in below decks. They were not fully dressed and could not see outside, but good discipline was maintained. Two RIM officers went down over the bow to see if men could be landed on the rocks. Fortunately they found that it was possible and the troops were ordered to find boots and rifles. The King's Rifles formed up on the port side and the York and Lancasters and the Middlesex on the starboard, to use both forward companionways. The men slung rifles and moved forward to climb down the rope ladders. When the ship suddenly listed to starboard the waiting men were brought up on deck. At first it was thought best to keep the women and children on board until daylight when it would be safer to get them off, but as the listing of the ship worsened they were brought to the bow and lowered onto the rocks. The men on the starboard side were up to their knees in water so they were told to discard their rifles and boots and move to the port side. Up until 4.35am the lights were still working but the electricity failed at that point and everything had to be done in complete darkness. At around 5am, because it was taking so long to get men down the rope ladders those who could swim were allowed to make their own way to the rocks. The first to go was Rifleman McNamara who secured ropes for others to haul themselves ashore thus avoiding the sharp larva rocks. By 5.30am the evacuation of the ship was complete without loss of life apart from a ship's cook and an officer's servant. The last soldier to leave the ship was Lieut-Col Forestier-Walker. There were many acts of bravery that night and strenuous efforts were made to save the lives of two men who died when they jumped overboard. Some salvage work was carried out but only a little could be retrieved. Commander Gerald Edward Holland of the Royal India Marine who was in charge of the evacuation was praised by the Viceroy of India for his work but had to attend a court martial where he was given a reprimand for the loss of his ship. The KRRC offered him honorary life membership of their officers mess. Everyone was subsequently conveyed 120 miles northeast to Mauritius on the British India SS Lalpoora and help was given to cloth the men and provide shoes for the 350 soldiers who had no boots. The Governor, Sir Charles King Harman gave a dinner for the officers who attended in various modes of dress 'which presented a most curious sight'. The KRRC were garrisoned at Curepipe, Port Louis, Mauritius while the York and Lancasters and Middlesex carried on to India. 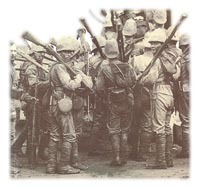 The Rifles remained in Mauritius until 5th March 1899 when they sailed to Natal on the RIMS Clive. The 1st Battalion took a prominent part in the first main battle of the war, and sustained many casualties. They were encamped in the area of Glencoe and Dundee, about 48 miles north-east of Ladysmith in Northern Natal. Three columns of Boers were converging on the area and the commandoes under Lucas Meyer had occupied the hills to the north of their camp. The KRRC were in the 4th Division of the Natal Field Force, 4000 men, commanded by the brave and popular Major-General Sir W Penn Symons. He was anxious to dislodge Meyer's Boers before the other enemy columns arrived. After a short artillery barrage, three battalions were sent up Talana Hill, the 1st KRRC, 2nd Dublin Fusiliers and 1st Royal Irish Fusiliers. They reached a wood but hesitated behind a stone wall because of the very heavy rate of fire pouring down the hill. Symons went to find out what was holding them up and set an example by advancing alone. He soon returned, and stiffly re-mounting his horse rode off to the medics where he was found to have a fatal stomach wound. But his action encouraged the battalions to face the danger and they managed to reach the next stone wall just below the summit. In the heroic storming of the hill, the CO of the 1st KRRC, Lieut-Col Gunning was killed and Captain Pechell was seen to die of a bullet through the neck. The disastrous artillery mistake caused death and injury among many in the 3 battalions. Other KRRC officers killed were Lieutenants Taylor, Barnett and Hambro, and six more wounded. Casualties among the NCOs and men were also high. After Talana the 1st Battalion was commanded by Major W Pitcairn-Campbell. The Commander of the Natal Field Force, General Sir George White was responsible for the defense of Ladysmith and knew that the approaching Boers would besiege the town so he sent out a large force to protect his lines of communication and attempt to defeat the army of General Joubert and Lucas Meyer. The 1st KRRC which had withdrawn to Ladysmith from Dundee was put in Colonel Grimwood's brigade but in the night march an error had occurred which meant that half the brigade became detached leaving the Rifles without the support of two battalions and the Mounted Infantry, which included a section of KRRC men. When Day broke, Grimwood's half brigade was in position at the foot of Lombard's Kop, a hill 4 miles east of Ladysmith. But it was a precarious position that was exploited by the Boers with their rifle fire and Pom-Poms. Grimwood proved himself unequal to the task and lost control of the situation. The Boer artillery managed to scatter the pack mules that were carrying the Rifles' ammunition, and although they were reinforced by the 2nd battalion KRRC and the Leicesters, they were pinned down all day by the superior Boer army. However the situation became worse when General White gave the order to retreat towards Ladysmith. The battalions stood up from the comparative safety of whatever cover they were using and walked away, but this provoked a storm of fire from the Boers which caused many casualties. The Rifle battalions were saved by two batteries of Field Artillery. The 13th Battery under Major Dawkins moved into position to give covering fire to the fleeing riflemen. The Boers concentrated their fire on the gunners so that they were now in big trouble. But the 53rd Battery under Major Abdy came to the rescue and held off the enemy while the 13th's guns were withdrawn. One company of the 2nd KRRC, under Captain Pearce-Serocold remained steady and provided covering fire. Although it would seem to be a day to be forgotten in KRRC history, it has to be born in mind that the 1st Battalion had only recently recovered from the horrors of Talana Hill in which many of their officers had been killed, and suffered a 48 mile retreat in wet weather. They had endured a night march and a full day of incessant and accurate rifle fire with little ammunition to fire back. The battle of Lombard's Kop had cost the 1st Battalion the lives of Major Myers (7th Battalion), Lieuts Marsden and Forster, and the 2nd Battalion lost Major H Buchanan-Ridell, brother of Lieut-Col Buchanan-Ridell, CO of the 3rd KRRC. Overall the British lost 57 other ranks killed, many of them riflemen, and 245 wounded. The besieged garrison at Ladysmith was hoping to be relieved before Christmas 1899 but Buller's reverse at Colenso had dashed the hopes of the British. The siege lasted from 2nd Nov until 28th Feb 1900. Within the town there were 13,745 soldiers and 5,400 civilians who suffered from disease, famine and the daily shelling by Boer guns. The 1st and 2nd Battalions of the KRRC were part of the garrison. The 1st had 20 officers and 665 men and the 2nd had 20 officers and 754 men. They were mostly responsible for defending the southern approach to the town (C Sector) in the area of Wagon Hill. The 3rd Battalion were in Buller's relief force, in the 4th Brigade (Lyttelton's) of the 2nd Division. At around 2.40am on 6th Jan, the Boers attacked Wagon Hill in force. Defending the hill were the KRRC, the Imperial Light Horse, a few Gordon Highlanders, and some sappers and sailors who were in the process of placing three large naval guns on the hill. The situation was desperate for the rest of the night as reinforcements didn't arrive until daybreak. Two companies of Gordon Highlanders and eight companies of the 1st and 2nd KRRC arrived at 7am. Another attack was taking place on Caesar's Camp, to the east of Wagon Hill. To reach the defenders of the Wagon Hill, three suicidal attempts were made to reach them. The first group were riflemen of the 1st KRRC under Major Mackworth (a West Surrey officer attached to the KRRC) who braved a curtain of rifle fire. Mackworth was killed and most of the men. That afternoon a terrible storm broke and all were soaked with torrential rain. This went on for several hours. Among the reinforcements were men of the 1st Devonshire regiment who made a heroic charge against the besieging Boers. The battle continued into the night and petered out by morning. The Boers had failed to take the hill, but only just. The casualties among the Boers were high due to artillery fire with shrapnel shells. The British lost 424 dead and wounded. 158 rank and file men were killed, 221 wounded. 17 officers died including Major Bowen, and 2nd Lieut Raikes of the 2nd KRRC. 28 officers were wounded including Lt McLachlan (severely wounded) of the 1st KRRC. Spion Kop is a flat-topped hill just north of the Tugela River and 10 miles southwest of Ladysmith. The name is forever associated with tragedy for the British Army. The terrace at the Liverpool Football ground, Anfield is called the Kop in memory of the many men from Lancashire who died there. This was another of Buller's disasters although Sir Charles Warren is the General who was mostly to blame. While the main part of the battle was taking place on the hill of Spion Kop, a diversionary attack was made by Lyttelton's brigade on the Twin Peaks, 2 miles to the east. In this action, the 3rd KRRC scaled the heights in a very determined way and achieved their goal. But the CO, Lieut-Col Buchanan-Riddell, was killed, as was Lieutenants Grand and French-Brewster. Four officers were wounded; Majors Thistlethwaite and Kays, and Captains Beaumont and Briscoe. The British losses over all were 243 dead and 1,250 wounded or missing out of a total of 30,000 men. The successful storming of the Boer defenses ended in disappointment because the KRRC had become cut off and found themselves in a dangerous situation. They had to be withdrawn from the summit causing much discontent among the men. The need for highly mobile infantry was more apparent in South Africa than in most other theatres of war. In the Zulu War and the First Boer War they proved their worth and a Mounted Infantry School was set up in Pietermaritzburg in 1882 under Capt H H Parr of the Somerset LI. The 3rd KRRC and 1st South Staffords formed a 70 strong detachment trained at this school. They were used in Egypt to keep a constant watch on the Egyptian lines 8 miles from the British beach-head at Alexandria to inform the C-in-C of any likelihood of an attack. In March 1899 the 1st KRRC arrived in South Africa after their posting in Mauritius came to an end. They were stationed in Peitermaritzburg where a detachment was posted to the Mounted Infantry School. This MI company comprised 5 officers and 42 NCOs and men, and was split into 4 sections. In May, one of these sections was sent with the battalion's G Company to Etshowe in Zululand. The remaining 3 sections went with the 1st KRRC, in Sept 1899, to camp at Dundee near Ladysmith. Whilst the Mounted Infantry were at Dundee war was declared, on 11th Oct, and the company was kept hard at work as picquets, especially at night. The commander of the company was Major Northey and the three sections were commanded by Lieuts Crum, Jeff and Majendie. At the Battale of Talana Hill on 20th Oct, Majendie's section of 22 men were sent around the other side of the hill with the 18th Hussars and a Mounted Infantry section from the Royal Dublin Fusiliers. They were surrounded and captured by the Boers. Lieut Crum and two other riflemen were attached to Majendie's section and they were all taken to Pretoria as prisoners. The remaining 2 sections of MI were in action at Lombard's Kop on 30th Oct where they supported the cavalry in a flank attack. After the siege of Ladysmith was lifted the MI went to Colenso as part of the 8th Brigade of the 4th Division. They were involved in various actions including one at Amersfoort on 7th Aug 1900 where the MI successfully stormed two hills. The men captured at Talana were released in June 1900 but were at first not fit enough to re-join the MI. Lieut F M Crum re-joined them on 5th Oct and assumed command of the company on 17th Oct. The remainder (Sergeant A J Hill and 21 others) rejoined on 25th Nov. In Jan 1901 they were stationed at Middelburg and on 23rd Jan fought off 300 Boers who attacked Lord Kitchener's train. Crum commanded the MI in this action and he and Sergeant George Ross were mentioned in Kitchener's dispatches for great bravery. They moved south from Middelburg with a column commanded by Col Pitcairn-Campbell (later Colonel of the 4th KRRC) and fought at Roodepoort on 2nd Feb. In this action Lieut Reade died of his wounds along with 4 riflemen, Sgt Burton was killed and two others wounded. After this the MI campaigned miserably in cold wet weather near Piet Retief where many men went sick. They finally returned to Middelburg in April, and in May were reinforced with some men from 2nd Tower Hamlets Rifle Volunteers. Captain Oakley and the 20 men from this unit proved themselves to be good shots and their enthusiasm helped boost morale. But during the months of June and August 1900, whilst watering or grazing their horses, 4 men were killed by Boer snipers. Two MI companies from the 4th KRRC joined the 1st KRRC MI at Middelburg on 16th Oct, and they were formed into 4 companies to be called the 25th MI Battalion, 364 men, under Major C L E Robertson-Eustace. The battalion formed part of the column commanded by Colonel G E Benson RA. This column, including another 435 cavalry, 500 MI, 650 infantry and 6 artillery guns, moved off to Driefontein. The column was under pressure from Boer commandoes and Benson decided to fall back on Reit Kull to the south west via Brakenlaagte. When the Boers were reinforced they attacked on the 24th Oct. The column had a hard fight and retreated through the night. The following day the MI spent 9 hours fighting on horseback suffering 2 officers and 9 men wounded. It began to rain early in the day on 30th Oct, and the 2nd Company of the Rifles MI ran into Boers who wounded Lieut Bircham and killed one rifleman. Crum, who was now a captain, was ordered to hold a small hill near the camp at Brakenlaagte. Southeast of the camp was Gun Hill where the 20-man first section of no.1 Company Rifles MI under Sergeant Ashfield and two artillery guns were joined by Colonel Benson, the Scottish Horse and Yorkshire MI. The Boers had been joined by General Louis Botha and 500 mounted men. This brought the Boer cavalry up to 1000, and they charged over the country towards Gun Hill. They dismounted in dead ground and stormed the hill where Benson and 180 men stood to defend it. The artillery men took the brunt of the attack having only fired 3 rounds. The casualties were high in this fierce fire fight; Ashfield's 20 men suffered 17 wounded and killed, and Colonel Benson was mortally wounded. The Boers had captured the two 15 pounders on Gun Hill. Crum's company were under fire and could not be reinforced. They included five officers and 15 other ranks. They bravely defended the hill for several hours but had to withdraw at nightfall reluctantly leaving 5 wounded men. Meanwhile, the camp was defended by no.3 Company Rifles MI and the other half of no.1 Company. Everyone dug in as fast as they could in the driving rain. Luckily, Botha's men remained on Gun Hill with their captured guns and did not retire until 3am. Many of the Boers were exhausted after a non-stop 24 hour ride to reach the battle. The British troops involved in this inconclusive battle amounted to 1700. Seven officers and 60 men were killed and 16 officers and 149 wounded. The Boers had lost 44 killed and 100 wounded. The KRRC Mounted Infantry lost Sergeant Ashfield, killed, and their surgeon Mr Robertson as well as eleven others killed. Five officers were wounded, Lieuts Crichton, Acland-Troyte, Seymour, Bircham and Daldy. Sergeant-Major Rowat and 39 riflemen were wounded.